The Federal Home Finance Agency’s Home Price Index shows home values up 0.8% in April on a monthly, seasonally-adjusted basis. April marks the third consecutive month during which home values increased and the index is now up 3 percent from last year at this time. As a home buyer in Bronx , it’s easy to look at the Home Price Index and believe that its recent, sustained climb is proof of a broader housing market recovery. Ultimately, that may prove true. However, we cannot base our buy-or-sell decisions on the HPI because, like the private-sector Case-Shiller Index, the Home Price Index is flawed. There are three main flaws in the FHFA’s Home Price Index. They cannot be ignored. First, the FHFA Home Price Index’s sample set is limited to homes with mortgages backed by Fannie Mae or Freddie Mac. By definition, therefore, the index excludes homes with mortgages insured by the FHA. 5 years ago, this wasn’t such an issue because the FHA insured just 4 percent of mortgage. Today, however, the FHA’s market share is estimated to exceed 30 percent. This means this the HPI excludes more than 30% of U.S. homes from its calculations right from the start. The index also excludes homes backed by the VA; jumbo mortgages not securitized through the government; and, portfolio loans held by individual banks. 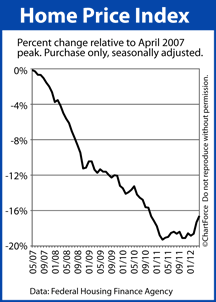 Second, the FHFA Home Price Index is based on the change in price of a home on consecutive home sales. Therefore, it’s sample set cannot include sales of new home sales, nor can it account for purchases made with cash because cash purchases require no mortgage. 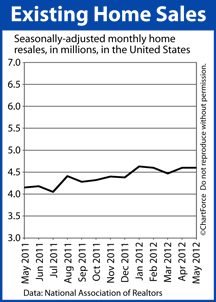 Cash purchases were 29% of the home resale market in April. Third, the Home Price Index is on a 60-day delay. The report that home values are up 0.8% accounts for homes that closed two months ago, and with contracts from 30-75 days prior to that. In other words, the Home Price Index is measuring housing market activity from as far back as January. Reports such as the Home Price Index are helpful in spotting long-term trends in housing but data from January is of little help to today’s New Jersey home buyers and sellers. It’s real-time data that matters most and the best place to get real-time housing market data isn’t from a national home valuation report — it’s from a local real estate agent. If you ever have the wish (or need) to execute your right to rescind, be aware that the process is a formal one. The required steps must be completed on-time, and in order, or else your request will be invalid. Typically, rescission requests are faxed to the settlement agent, notary, or title company assigned with the refinance. It’s good practice to ask for an acknowledgement of receipt as proof of delivery, too. The new construction market continues to improve. As reported by the Census Bureau, 369,000 new homes were sold last month on a seasonally-adjusted, annualized basis. A “new home” is a home that is considered new construction. May’s data marks the highest number of new homes sold since April 2010, the last month of that year’s federal home buyer tax credit. It’s also a 14% increase over the rolling 12-month average. The news was somewhat expected based on the most recent Homebuilder Confidence survey, which rose to a 5-year high. Home builders have been reporting higher sales volume and rising buyer foot traffic since October of last year. The May New Home Sales report confirms what builders already told us. Furthermore, new homes are selling more quickly than builders have built them, lowering the national “home supply” to levels not seen since October 2005. There are currently 145,000 new homes for sale. A supply of 6.0 months is believed to represent a market in balance. Anything less connotes a “sellers’ market”. 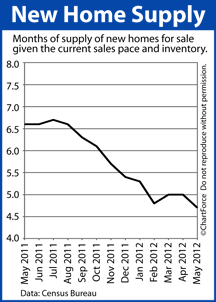 At the current pace of sales, the entire new home housing stock would be exhausted in 4.7 months. For all its strength, though, the Census Bureau’s New Home Sales data may also be “off”. Although New Home Sales were said to rise by roughly 8 percent nationally from April to May, the government’s monthly report was also footnoted with a ±12.2% margin of error. This means that the actual New Home Sales reading may have been as high as +20% last month, or as low as -4%. The values could be positive or negative — we can’t know for certain. However, that’s not to say that the New Home Sales should be ignored. Longer-term, new home trends have been positive and builder confidence survey suggests the same. 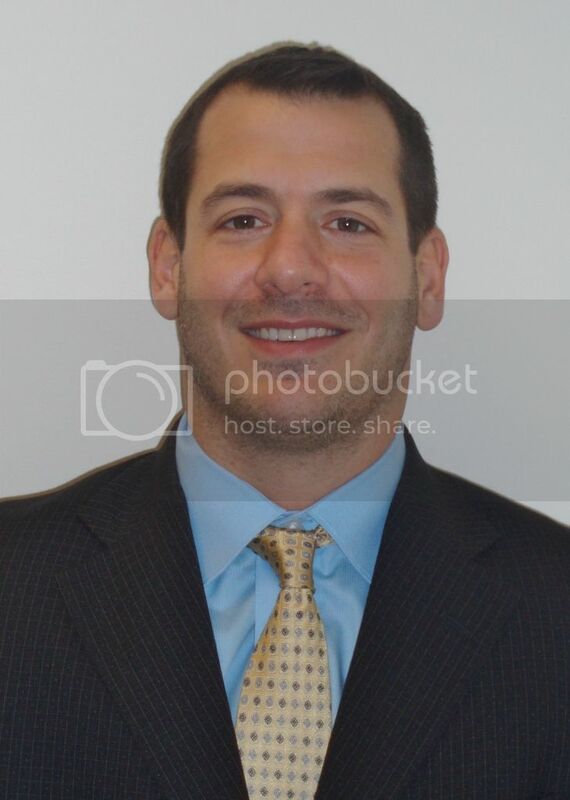 If you’re in the market for new construction in Bronx , you may want to go into contract soon. Home prices and mortgage rates remain low — a terrific combination for today’s home buyers. Mortgage rates have resumed their downward trend. According to Freddie Mac’s weekly Primary Mortgage Market Survey, the national average 30-year fixed rate mortgage rate fell 5 basis points to 3.66% this week. The rate is available to “prime” borrowers who are willing to pay, on average, 0.7 discount points plus a full set of closing costs. 30-year fixed rate mortgage rates are down in seven of the last eight weeks but, depending where you live, the mortgage rates made available to you will vary. The Freddie Mac survey notes that mortgage rates vary by region. For example, mortgage applicants in the West Region received the lowest rates from lenders, on average, but also paid the highest number of discount points. Discount points are a specific type of closing cost where 1 discount point is a fee equal to one percent of your loan size. 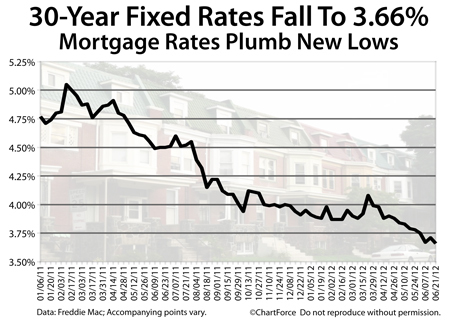 Nationally, one year ago, the average 30-year fixed rate mortgage rate was 4.50%. Today, it’s 3.66%. This 84 basis points difference yields a monthly savings of $49 per $100,000 borrowed at today’s rates, or $588 per year. A $400,000 mortgage would save $2,352 annually at today’s mortgage rates as compared to June 2011. The 15-year fixed rate mortgage rate is also low, averaging 2.95% nationwide with 0.6 discount points. This is the second-lowest reading in recorded history. However, when the 15-year fixed averaged 2.94%, banks required an average of 0.7 discount points to get it. One could argue that this week’s average rate-and-points combination is actually a better “deal” because closing costs are lower. Mortgage rates continue to break new lows so, if you’re eligible to refinance, the timing may be right to explore your mortgage options. Similarly, if you’re in the market to buy a home, today’s low rates will help to keep your home affordability high. Talk to your loan officer about capitalizing on the lowest rates of all-time. Rates in Westchester may not rise starting next week, but when they do rise, they’ll expected to rise quickly. For the fifth consecutive meeting, the Fed Funds Rate vote was nearly unanimous. Just one FOMC member, Richmond Federal Reserve President Jeffrey Lacker, dissented in the 9-1 vote. In its press release, the Federal Reserve noted that the U.S. economy has been “expanding moderately” this year. Beyond the next few quarters, the Fed expects growth to “pick up very gradually”. In addition, the Fed re-acknowledged that “strains in global financial markets” continue to pose “significant downside risks” to the U.S. economic outlook. This statement is a repeat from the FOMC’s April press release and is in reference to the sovereign debt concerns of Greece, Spain and Italy, plus the potential for a broader European economic slowdown. With respect to inflation, the Fed said that pressures have declined, led by falling oil and gasoline prices. Longer-term inflation expectations remain stable. The Fed also pledged to keep the Fed Funds Rate at “exceptionally low” levels at least through late-2014. Mortgage markets are muted post-FOMC. There has been no real change in rates, although that may change later in the day, or weel. Mortgage rates in Manhantten remain at all-time lows. 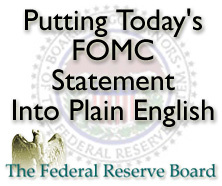 The FOMC’s next scheduled meeting is a two-day event slated for July 31-August 1, 2012.